SeatDetail Table: To save booked seats information. One user can select multiple seats, so separate table is used. There is no primary key in this table so you need to create insert stored proc. It will be mapped in EF. First Create database and stored proc as mentioned above. You will get the above db structure – screen shot and get tables in edmx file. Expand “Select Insert Function” in ‘Mapping Details’ dialog and select “SP_SeatDetails_Insert” and map with same property name. Add new page and use code from my previous article. Before going code, It is assumed seat charge and tourid comes from different tables and available on server side. 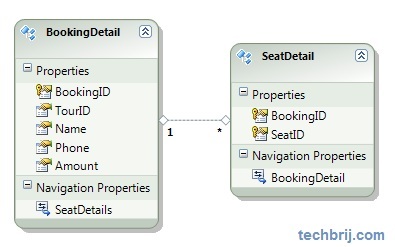 Now, our first object is to retrieve data from database and show booked seat in the page. We have defined calling of init method from server side. Remove calling of init from client side and add following in init method to set charge per seat. After selecting seats, when user clicks on button, A modal popup will be displayed with calculated price. 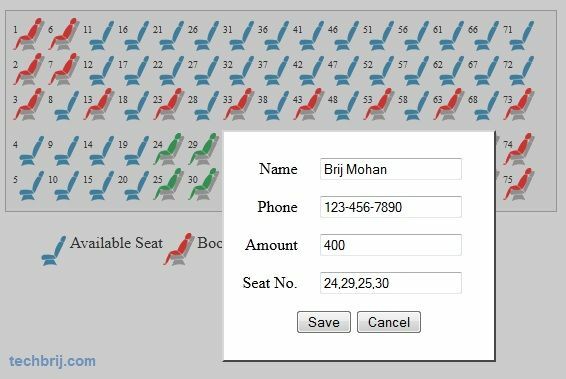 User gives name, phone and click on save button, seat information will be saved in database. Hope, It helps. If you have any query, put in below comment box. when I run the program, i get this error “The underlying provider failed on Open.” would you please help me? thnxx..this helped me a lot!!! in my project i have three theatres.so how can i use your code for three theatres ? How can I prevent the gap between chosen seats? can you do this usiong php? Can you please explain how to do this with MVC3 Application? Wow!! UR Blog superb and interesting for me. and finding great challenge in doing Seat Select module. Would you please advice how to do it. doubt ,How Can I Hold a Seat till payment with time period .